Inhaling tiny fibres made by the nanotechnology industry could cause similar health problems to asbestos, say researchers. Some are similar in shape to asbestos fibres, which have caused lung cancers such as mesothelioma. 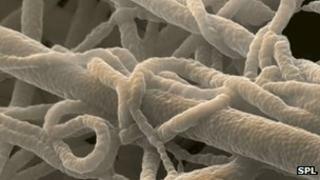 Nanofibres are in a range of goods, from aeroplane wings to tennis rackets. Ken Donaldson, professor of respiratory toxicology at the University of Edinburgh, said: "Concern has been expressed that new kinds of nanofibres being made by nanotechnology industries might pose a risk because they have a similar shape to asbestos." Prof Donaldson said: "We knew that long fibres, compared with shorter fibres, could cause tumours, but until now we did not know the cut-off length at which this happened. "Knowing the length beyond which the tiny fibres can cause disease is important in ensuring that safe fibres are made in the future as well as helping to understand the current risk from asbestos and other fibres." Prof Stephen Spiro, from the British Lung Foundation, said cases of mesothelioma had almost quadrupled in the past 30 years because of asbestos. He added: "This research is particularly interesting as it gives us an indication of the size of fibre that might lead to mesothelioma if inhaled. "If confirmed by subsequent studies, this minimum fibre length can be cited in industry guidelines to help ensure people are not exposed to the sorts of fibres that may lead to such deadly diseases."